Ten minutes of pure special effects wonderment, from one of our favourite television shows. 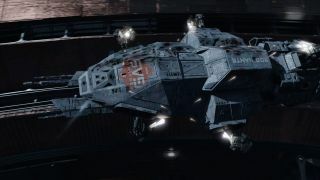 Fans of sci-fi hit The Expanse have a while to wait until the fourth season's release. After the show was dumped by SyFy, and then picked up by Amazon, it won't be streaming again until May of 2019. But if you're also a fan of the show's outstanding special effects, a new sizzle reel released by the show's VFX team might be enough to tide you over. Rocket Science has worked on a range of film and television projects, from John Wick to Hannibal, but the company's work recreating the gritty, spacecraft of The Expanse that stands out. Very few of the TV show's ships can be called pretty - they're often blocky, dirty, and more than a little battered - but watching them maneuver, burn thrusters, and flip about in a ballet of Newtonian physics is pure joy for a lot of fans of hard science fiction. The Expanse is based on a series of award-winning novels by James S.A Corey, the pseudonym of writers Daniel Abrahams and Ty Franck.